The museum owes its origin to a donation to the city of San Francisco by Chicago millionaire Avery Brundage, who was a major collector of Asian art. The Society for Asian Art, incorporated in 1958, was the group that formed specifically to gain Avery Brundage's collection. The museum opened in 1966 as a wing of the M. H. de Young Memorial Museum in Golden Gate Park. Brundage continued to make donations to the museum, including the bequest of all his remaining personal collection of Asian art on his death in 1975. In total, Brundage donated more than 7,700 Asian art objects to San Francisco. Until 2003, the museum shared a space with the de Young Museum in Golden Gate Park. As the museum's collection grew, the facilities in Golden Gate Park were no longer sufficient to display or even house the collection. In 1987 Mayor Dianne Feinstein proposed a plan to revitalize Civic Center that included relocating the museum to the Main Library. In 1995, Silicon Valley entrepreneur Chong-Moon Lee made a $15 million donation to launch the funding campaign for a new building for the museum. During its last year in the park it was closed for the purpose of moving to its new location, and it reopened on March 20, 2003, in the former San Francisco city library building opposite the San Francisco Civic Center, renovated for the purpose under the direction of Italian architect Gae Aulenti. Lord Cultural Resources, a cultural professional practice, was also commissioned to undertake a three-part sequence of planning studies for the relocation of the Museum. The old Main library was a Beaux Arts-style building designed by George Kelham in 1917. The new $160.5 million project, designed by Gae Aulenti, introduced an indoor sky-lit court to provide a dramatic central core to the museum. Removing some interior walls, Aulenti created a sense of openness to facilitate visitor movement and the display of the artwork. The new 185,000-square-foot (17,200 m2) museum increased the exhibition space by approximately 75 percent compared to the former Golden Gate Park location. In October 2011, the museum launched a new identity. Designed by the branding agency Wolff Olins, the logo is an upside down A, representing the idea of approaching Asian art from a new perspective. In March, 2016, the museum announced that it will build an additional new pavilion to its current San Francisco Civic Center Building. The new pavilion will sit atop an existing, lower-level wing on the museum's Hyde Street side; and it will add about 9,000 square feet of new space to the museum's first floor. The expansion is expected to open by September 2019. In January 2019, Abby Chen was appointed as the Head of Contemporary Art. The collection has approximately 18,000 works of art and artifacts from all major Asian countries and traditions, some of which are as much as 6,000 years old. Galleries are devoted to the arts of South Asia, Iran and Central Asia, Southeast Asia, the Himalayas, China, Korea and Japan. There are 2,500 works on display in the permanent collection. A Japanese tea house is displayed on the second exhibition floor of the museum. This teahouse was built in Kyoto, disassembled, shipped to San Francisco and reconstructed in the museum by Japanese carpenters. The name of the tea house can be seen on a wooden plaque "In the Mist" located next to the Tea House on the second floor of the museum, The calligraphy on this wooden plaque is based on the calligraphy by Yamada Sobin and commissioned by Yoshiko Kakudo, the museum's first curator of Japanese art. The Tea House was designed by architect Osamu Sato as a functioning teahouse, as well as a display case. It is a three and three-quarters (sanjo daime) mat room. It is complete with an alcove for the display of a scroll and flowers, an electric-powered sunken hearth used in winter for the hot water kettle, and a functioning preparation area (mizuya) with fresh running water and drain. ^ "Asian Art Museum | Collection". 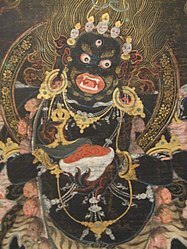 www.asianart.org. Retrieved September 2, 2015. ^ "CHONG-MOON LEE / From the depths of longing for a hamburger he couldn't afford and contemplating suicide, this entrepreneur rose to such success he was able to give $15 million to S.F. 's Asian Art Museum". San Francisco Chronicle. November 5, 1995. ^ "A Bold New Look For SF Art Museum, In Jittery Economic Times". September 30, 2011. ^ "Asian Art Museum announces expansion". March 1, 2016. ^ "Once-struggling Asian Art Museum set for major 'transformation'". ^ Edelson, Zachary (September 26, 2017). "San Francisco's Asian Art Museum Expansion Revealed - Metropolis". Metropolis. Retrieved October 14, 2017. ^ "Curator Abby Chen to Head Asian Art Museum's Contemporary Art Department". KQED. December 13, 2018. Retrieved February 9, 2019. ^ "Japanese teahouse, tea masters to be part of new Asian Art Museum". December 15, 2002. ^ "Teahouse at the Asian Art Museum". Wikimedia Commons has media related to Asian Art Museum (San Francisco).